RapReviews.com Feature for June 28, 2016 - BRBRCK's "Backstage"
The Brooklyn-based emcee named BRBRCK (that's pronounced "Ber-Ber-Rock", y'all) is more of a bohemian hip-hop artist than I realized. Not only does he use live instruments to lend organics to his studio productions, but also comes equipped with his own band (the iLL harmonic) when performing live shows. He proved his alternative lyrical style on his first EP "6Songs" - showing an affinity for both wordplay and being thoughtful. Though literally only six songs, the EP showed a pretty brief glimmer for the man's offerings with room for improvement. 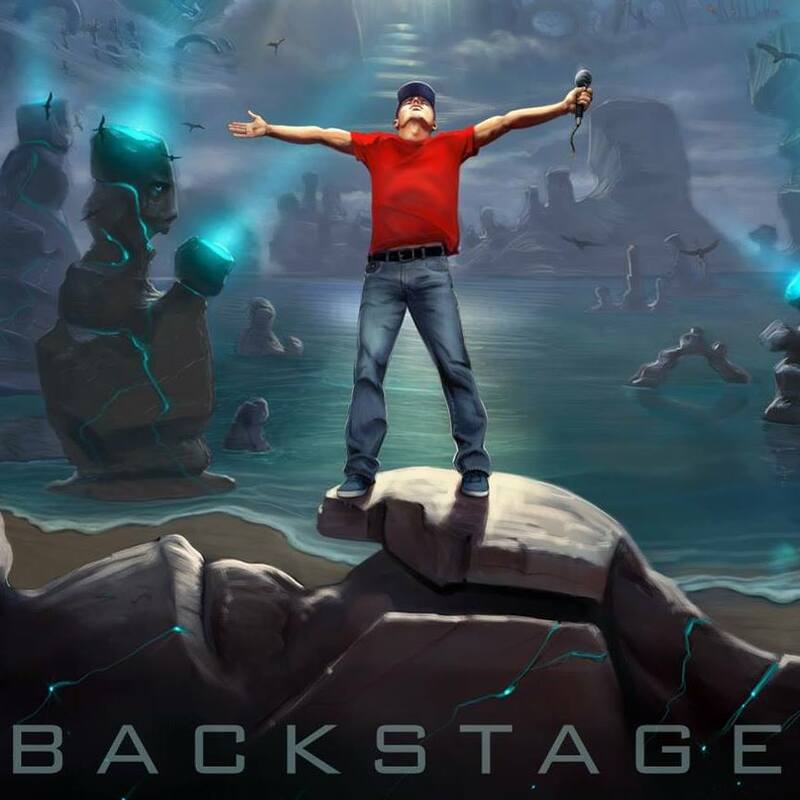 On his latest sophomore album, "Backstage", we get a more full-view musical image of BRBRCK. Unlike "6Songs", this sophomore outing has BRBRCK touching musical sides of himself that previously weren't fully explored. Clearly a student of the upper-echelon of hip-hop lyricists, he has no compunctions about experimenting with the technical aspects of rapping. He's got multi-syllables to his rhymes with a literate b-boy aesthetic. Producing the entirety of "Backstage", the album actually starts off *on stage* with a live sampled introduction on "Front On me Not" before the lyrics drop. It has a live saxophone and the drums are pretty minimal around the first eight bars. Not bad for the intro, but "Boom Bap" is where the album really takes flight. A poppy, urban electro-funk production, it's lyrically a love letter to the Big Apple and a homage to hip-hop from the 90's. Featuring all three members of the rap group Otherf--kingworldly (himself, MCK, and John the McBANG), it's got the top-down, clear blue skies feel of yesteryear. In a partial contrast, the next track "Waiting for the Sun" is more aggressive with a modicum of humor. With Alyssa Robbins on the hook and some hard guitar licks, BRBRCK spits a first-person narrative about a clubber-hopper who simply has no luck in the nightlife. MCK makes another appearance on the brief interlude entitled "A Bushwick Prayer". It's an almost stream-of-consciousness monologue that leads into the next track "BrunchDrunk, New Brooklyn". A Violin-driven track, it kind of reminds me of Company Flow's "Patriotism" with its tongue-in-cheek social commentary. MCK takes the first verse, and then BRBRCK. They both assume the point-of-view of trendy hipsters moving into gentrified NYC neighborhoods, oblivious to what's happening to long-time business establishments and original residents/families. The next three tracks are what I've dubbed collectively as the "Oliver Stone Vietnam Trilogy". Multi-track, distorted analog vocals on the hook is what begins "Champagne Hangover". With echoing snares and an aggressive guitar, this is the most honest and rawest I've heard BRBRCK. Lyrically, he raps about the young adults in his generation. How they want success in life and in work, but fail more often. So they get jaded and use drugs and alcohol as a transitory escape. The work they put in is reminiscent of "Labor" and "Getaway Car" by Aesop Rock. "The Great Depression" expounds on the previous track. The guitars and piano are melodic, and the lyrics are in hindsight. On it, BRBRCK lyrically muses about why he still loves being a hip-hop artist. Despite not yielding any major success and making his grind harder to the point where masochism is a valid assessment, he still loves it and perseveres. If the former two tracks can be considered "Platoon" and "Born on the Fourth of July," then "Cynicism in My Old Age" is "Heaven and Earth". I'm not saying it's bad, only that it's the weakest of the three. It's got a blues-saxophone opening, synths, and ties in with the last two tracks, but it doesn't do much for this listener. And I'm out like a mouse-- what am I talking about?" The penultimate track "Ricochet" jumps between a double-time and syrupy rap flow with some bouncy kickdrums while the album closer "Dream Machine" proves to be more than just a clever title. It starts with an ethereal feel with atmospheric vocals and lyrically it's about the night. Specifically, nights that he and his crew have used for musical brainstorming. The live feel of the track is the work of most of the iLL harmonic come together. I have to say, BRBRCK showed me and my fellow listeners much more than a mere "something" on this album. He and his group dug deep to bring an album that went light years beyond the debut EP. Everyone who listens to rap has their own standards for what they consider "real hip-hop". BRBRCK meets mine and at the same time creates hip-hop that stands out.